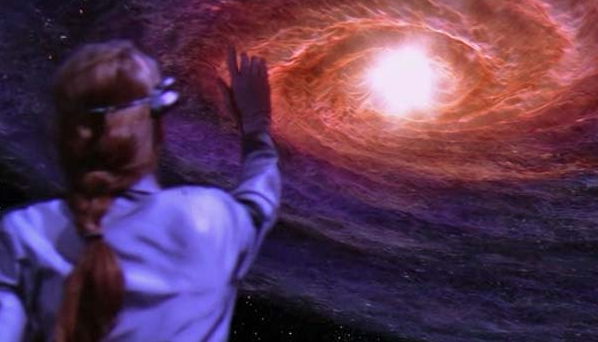 Now that everyone is agog with Neil deGrasse Tysonâ€™s reboot of Carl Saganâ€™s Cosmos, I thought it might be fitting to devote this weekendâ€™s movie recommendation to a film that draws on another one of Saganâ€™s gifts to the world: Robert Zemeckisâ€™ adaptation of Saganâ€™s Contact (1997). Jodie Foster plays Ellie Arroway, who is just the kind of astrophysicist you hope fills the hallways of NASA. Sheâ€™s bright, dedicated, and derives inexhaustible fulfilment from listening to radio signals from space. Despite her recognized potential in graduate school, she has failed to publish influential papers and secure large grants; more devastating still is her failure to select an opportune research topic for her career. She pursues what is generally acknowledged to be a futile interest in the SETI program â€“ the Search for Extra-Terrestrial Intelligence. However, just as she is about to be shut down by the powers that be, she discovers an unmistakeably salutatory signal coming from the distant star system Vega. Arrowayâ€™s project quickly becomes a race to decipher the puzzle that the Vegans have transmitted. Once it becomes clear that the signal contains a set of instructions for a machine that will transport one person to Vega, an international effort to build the machine is set in motion. That effort is accompanied by the determination about who gets to be the first person to communicate with aliens on behalf of humankind. Two of Saganâ€™s favorite preoccupations ensure at least minimal cerebral engagement for the viewer. The first is the noble yet fragile ambition of the scientific pursuit of truth. This is low-hanging fruit for any script-writer looking to deploy stirring rhetoric about how precious the human sense of adventure is, and how necessary it is that that sense be carefully nurtured. The second is the dialogue between faith and reason. Against Arrowayâ€™s unremitting reliance on empirical scepticism, Matthew McConnaughey appears as a priest who represents the voice of those who believe in the existence of God. As might be expected from Zemeckisâ€™ characteristically schmaltzy directorial style, both of these themes are handled fairly tritely. Ultimately, similarities are emphasized and differences are minimized, and everyone gets along just dandy. The scientists are reminded that their profession relies on more than a few leaps of faith; the believers come to respect the value of the scientists engaged in a common enterprise; â€œresearchâ€ is re-fashioned into a international collaborative kum-bay-ah that anoints the USofA as the scholars-in-chief. Yippee and huzzah. However, other preoccupations that are largely ancillary to the main plot are commendably handled. Firstly, the difficulties Arroway encounters in being taken seriously bring to the fore the challenges faced by women in academia. Tom Skerritt plays David Drumlin, the director of the NSF, who mansplains to Arroway just as a curmudgeonly supervisor disappointed in his star student squandering her potential would. Secondly, the need to secure soft money, which occupies the entirety of the filmâ€™s second act, highlights how the dependency of scholarship on private donors can frustrate or pervert the scientific enterprise. Out of that miasma appears John Hurt as S.R. Hadden, the wealthy deus ex machina who funds Arrowayâ€™s project when no-one else is willing to do so. Although Hadden saves the day, Arrowayâ€™s desperate reliance on his money shows just how delicate â€˜pie-in-the-skyâ€™ research really is. Rather than embed the trailer for the film, Iâ€™ll instead leave you with the opening shot, which provides a beautiful reminder of the humbling insignificance of our planet.